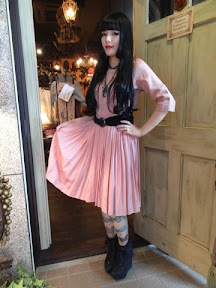 I am in love with Grimoire Almadel's newest shop girl, Yukari. I love her hair, I love her make-up, I love this coord. And I'm promptly going to MAC this payday and getting a new red lipstick. I'm still in love with suspenders and bowler hats. I also love the wedge shoes. Kaori, from the Grimoire Almadel blog. Lace-up wedges! I love this! I just want to drop by and said thank you. Your blog contain so much helpful/inspired tips for dolly kei fashion.